The AA Certified Advanced RPA Professional Course prepares you to become a professional RPA developer and implement automation solutions. 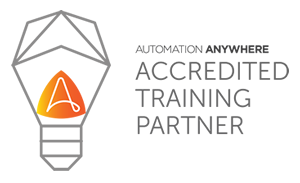 It is AA certified, hence upon completion and passing the assessment you will be awarded an ‘Automation Anywhere Advanced RPA Professional Certificate’ by AA. The course covers key topics in relation to development on Automation Anywhere platform. Upon completion, you will have a very good understanding of AA Enterprise platform, Architecture, and its components; and independently develop Bots for your processes. This course is for professionals who would like to develop and build upon their understanding of RPA and Automation Anywhere technology. It is intended to be the first step towards an Automation Anywhere Professional Certification and it helps one learn to design and develop Bots in Automation Anywhere. The course curriculum is the same for the Weekday or the Weekend programme. All the topics are covered with a mix of demos and exercises during the programme. This 3 hours self-paced eLearning introduces the learners to the field of Robotic Process Automation and provides basic information on the AAs RPA tool. This 8 hours self-paced eLearning focuses on the knowledge required to develop bots which covers all the features, functionality and operations of the product. Q: What is included in the course fees? The course includes access to eLearning materials, the course itself including course materials, access to practice environment and the certification. Q: How long do I have access to the practice environment for? The practice environment will be provided to you for a duration of 30 days from the start of the course. Q: Who provides the certification? The certification is done by Automation Anywhere and is included in the course. The certificate will be issued by Automation Anywhere. Q: How are instructor led sessions conducted? All instructor led sessions are conducted online and the trainer will be available to discuss topics and your questions during these sessions. Q: Can I do certification only without the training course? Certification is an integral part of the course and hence cannot be done independently. Q: What happens after I have made the payment? You will get a confirmation email after the payment has been confirmed. A welcome email will follow which will provide more details on the training and various stages and how you will be able to access the content. Please do contact us if you have further questions.